Otto August Schulz, Leipzig; Robert Forrer, Strasbourg; Rudolf Busch, Mainz; his sale, Frankfurt, Joseph Baer, May 4, 1921, lot 293; purchased in Apr. 1937 from Maggs Brothers Ltd., London for William S. Glazier (1907-1962), New York; deposited in the Pierpont Morgan Library by the Trustees of the William S. Glazier Collection in 1963. 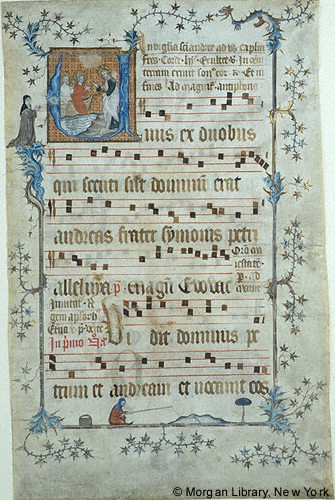 Single leaf from an antiphonary, Franciscan use; written and illuminated in France, ca. 1400. Decoration: 1 historiated initial (Christ calling Saints Peter and Andrew, fishing), 1 full border with marginal figures, 1 filigree initial.